AFTER an extra four games in 2018 compared to last year, for 10 of the 12 TAC Cup Girls sides, their season comes to an end on Saturday. All 12 sides want to go out with a bang and each and every one of the six matches are being played at RAMS Arena for a ‘Super Saturday’ of football. 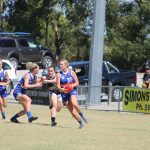 For Geelong Falcons, they know they have a week remaining in their season, with their likely opponents the Northern Knights – unless the Sandringham Dragons pull off more than a miracle to overtake the Knights on percentage. For many, it is one last chance to watch the most talented junior footballers in action in what is expected to be a huge day for players, clubs, staff, families and friends. In the first game on the second oval at Craigieburn, the Greater Western Victoria (GWV) Rebels face the Oakleigh Chargers. The Rebels are firing on all cylinders of late, and welcome the likes of Hannah Simpson, Denver Henson and Maggie Caris into the side, with four changes confirmed for the final game of the season. Oakleigh has brought in Laura Mayne and centre-half back Emily Hastie, while Elisabeth Jackson is the one confirmed out. On the main oval, Northern Knights will look to bounce back from their first loss of the season against an out-of-form Murray Bushrangers. The Bushrangers will be buoyed by a number of stars returning including Rebecca Webster, Claudia McKimmie and Olivia Barber all named in the side, while Grace Egan and Ada Chessor have been named as emergencies. The Knights will look to overcome the loss of Marnie Jarvis who is out for the round nine clash, while Gulia Ceravolo and Taylah Manson have made the interchange bench for the 11.15am clash. By the time the Geelong Falcons take the field they should have a confirmed grand final opponent – if the Knights do indeed get the four points – however a loss and the Falcons might cast their eyes over to the other ground where the Dragons are playing. Western Jets will look to finish their season on a high, bringing in four players including Hannah Bult and Kaitlyn O’Keefe who should both add some firepower to the Jets’ forward line. For the Falcons, Mia Sheppard in the one confirmed out from the side, with defender Sarah Hungerford taking her place in the 22 for the match. Sandringham fans will undoubtedly be keeping a close eye on the Knights’ match prior to the Dragons’ own match despite the most unlikely of miracles needing to happen. For those who like mathematical probabilities, there needs to be about an 80-point or more differential between a Sandringham win and a Northern loss for the Dragons to catch the Knights’ percentage. Julia Redmond returns for the final clash and has been named up forward, while defender Ella Cornish, and Charlize Bird are the other inclusions, while overager Jennifer Ross is an omission. For the Dragons, they have brought back some serious X-factor with the likes of Molly Denahy Maloney, Laura Amelung and Winnie Laing all back in to a side that is in red-hot form. In the final game on oval two, the Dandenong Stingrays look to make it four from four to close out the season. The Stingrays have thrown the magnets around and brought in Zoe Hill, Alice O’Sullivan, Saige Bayne, Grace Hodder and Eloise Allen-Burns who have all shown they can be important players to the Stingrays outfit, while Molly McDonald is among three players out of the round nine side. For Bendigo, ruck Dayna Kelly-Guthrie returns as does important players midfielder Jemma Finning and small forward Maeve Tupper, while Maddie Baldwin is among four outs from their round eight team. In the last game of the day, the Calder Cannons host the Eastern Ranges with both teams hoping to finish on a high. The speedy Grace Dicker is among three confirmed ins, while Kayley Reid and Sophie Cameron are out of the round nine side. For Eastern, Paige Buruma returns, as does the likes of full-back Sophia Zappia and Brittany Cubitt as 23rd player. Kate Ridley is the only confirmed out for the Ranges. WITH only three rounds left in the TAC Cup Girls competition, team selection is becoming increasingly unpredictable, with many exciting young new faces coming into line-ups this week. However, there are also some big outs with a few teams having to take the field without some of their stars this weekend. Oakleigh will be without star midfielders, Alana Porter and Katie Lynch as well as their dominant force in the ruck, Charlotte Moon. Nicola Xenos will also be watching from the sidelines instead of playing her usual role in defence. But there is no shortage of talent among the incoming players with two Bulleen Templestowe players in Elisabeth Jackson and Georgia Relph making their way into the line-up. Dandenong enjoyed its first win in round six but lose AFLW Academy forward, Brooke Struylaart to injury this weekend. The Stingrays will be glad to see Grace Hodder come into the side this week and will be hoping to see her continue to play some good footy. Abbey Jordan and Brooke Borchard are also among the other ins for the Stingrays. 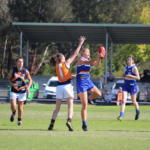 One of Greater Western Victoria’s (GWV) best players last week, Ella Wood will miss this week, and will join Katie McAloon, Ally Trigg, Ayesha Nicholson, Chloe Leonard and Nekaela Butler on the sidelines. But the Rebels have bought in key players, Renee Saulitis, Stephanie Glover, Isabella Simmons and Rene Caris to fill the hole left by the outs, giving them a chance to compete strongly against Murray. Some of the Bushrangers’ most consistent players in Sophie Damon, Julia Harvey and Ada Chessor will not take the field at RAMS Arena on Saturday. They will be replaced by some key ins though, with Eloise Ashley-Cooper returning to defence while Chelsea Knight rejoins fellow midfielder, Claudia McKimmie, who is fresh off a two-goal game. Following two consecutive losses, the Ranges have bought in all their big guns for this week’s clash against Gippsland. 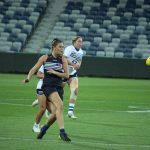 AFLW Academy defender, Georgia Macpherson, along with the likes of Paige Buruma and Emma Horne come into the Eastern line-up to fill the gaps of key outs, Abbey Tognazzini and Olivia Meagher. Gippsland forward, Nikia Webber will not have a chance to continue her climb up the goal-kicking tally this round, but will hopefully return next week to continue her blistering form inside 50. The Power will be hoping that Sophie Walker, who comes into the side this week, can kick some goals in Webber’s absence. 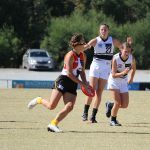 The Sandringham Dragons are flying at the moment and as a result, Georgia Emberton is the sole omission from the round six side. Taylah Grasso and Grace Bridges are among the ins this week, and will be hoping to keep the Dragons’ winning streak going. The Western Jets will be without their leading goal-kicker, Caitlin Greiser this week but welcome in Taylor Rose Evans and Taylah Kolevski into the forward line to fill the gap. Mollie-Ann Gregory, Chelsea Jansen and Abbi Bolt are the other players who have been named in the Jets’ line-up this round. 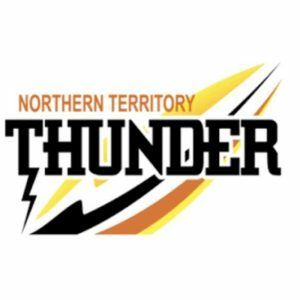 The Northern Knights have had a huge shake-up to their side, naming goal-kicking forward, Alyssa Bannan and mid/ forward, Abigail Bennett as emergencies this week. But the Knights welcome back some important players this week, including Jessica Fitzgerald, Ellie McKenzie and Neve O’Connor, who will look to make it seven from seven on Sunday. Key players including Bree Heiden and Olivia Taverna will be watching from the sidelines in round seven, but Bendigo has brought in some talented players for the trip to Preston. Emily Cooper, Sharmaine Reilly, Mia Ward and Tess Goodrem come into the side and would love to cause an upset win over the high-flying Knights. Calder consistent players, Kellie Sutton and Terira Fry will not take the field against Geelong, but the host of ins are quite remarkable for the home side. Important players such as Makeisha Muller and Laura Cocomello come into the side as well as Madison Prespakis’ sister, Georgie Prespakis, which could spell trouble for the Falcons! Versatile AFLW Academy member, Denby Taylor will not make the trip to Craigieburn this round but Geelong has brought in fellow AFLW Academy member, Eliza Shannon to take her place. Other ins for the Falcons include Sophie Dinneen, Ella Mahoney and Jemma Dover.